the life of a limb: Christmas Day! It was time for Santa to come visit! I was pretty excited this year for Christmas because it's really the first year that Austin has understood what is going on. I thought he was going to be waking me up super early but he slept in way late. I wanted to wake him up at 8 but I let him sleep until 9:30 since he had a long day ahead. 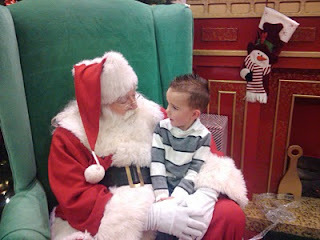 All he would tell Santa he wanted was something Cars and a Mr. Potato Head with a mustache so I am glad he loved everything else he got. He had a lot of fun opening all his presents from Santa and got spoiled like always! Pretty soon all the family started showing up and our house was filled with kids and wrapping paper! Our family is pretty big and I love when we are all together. All the kids liked the pillow pets they got from Grandpa & Grandma. Austin got a panda bear and carries it around quite a bit. Austin got Toothless, the dragon from How to Train Your Dragon and that was probably his favorite toy of the day. His Leapster and Toothless have entertained him for hours. It isn't very often I can get my dad to smile like this for a picture so I had to sneak a picture while he was laughing! Everyone left here around 2 to go see other family and Austin went to his dads. Crazy Christmas morning and super quiet Christmas night!